Most consumers these days have an assortment of frequent flyer miles and credit card rewards points, whether they earn them from having flown on airlines, or acquired them from banks for credit card spending. For consumers, these miles and rewards points can have a substantial value as they can be used to obtain expensive plane tickets or months of hotel lodging. They can also be used to purchase various goods, or gift certificates redeemable in a variety of retail stores. I once represented an executive who previously earned six figures, but was now without a job. He had over 800,000 American Express Membership Rewards points – enough to redeem on airlines for several international first class trips, among other things. He could have also easily redeemed them for over $8,000 in retail gift certificates. What happens to these valuable points and miles when a consumer files for bankruptcy relief? Can they be protected? You may have seen one of my favorite movies, Up In the Air, in which George Clooney, who had millions of air miles, flew around the country terminating executives and other employees. They probably had some air miles, too. Frequent Flyer Miles and Rewards Points – Are They Even an Asset of Yours? In deciding how to treat miles and points for bankruptcy purposes, we start by looking at what kind of assets they are. A consumer who files for bankruptcy must list all assets in the bankruptcy petition. However, there is an issue as to whether frequent flyer miles are an asset that must be listed. All frequent flyer programs have fairly comprehensive terms and conditions that uniformly indicate that the miles and award points have no monetary value whatsoever. These loyalty programs also state that miles are personal and cannot be assigned, traded, willed or otherwise transferred, except with consent of the program. In addition, most programs state that membership terminates upon a member filing personal bankruptcy. Also, all airline programs vigorously prohibit the sale of award tickets. Many frequent flyer loyalty programs and point programs, such as the popular American Express Membership Rewards program, expressly state that miles or points are not property of the member, and are not transferable by operation of law to any person or entity. Some actually state that the miles are owned by the program. Although it can be argued that a consumer debtor has a legal or equitable interest in the miles or points, and that this interest must be reported in the bankruptcy schedules, that argument is defeated by the terms of the loyalty programs which state that the member does not have a property interest in them. Thus, if a program states that the miles have no value and that they are not owned by the consumer, the reasonable conclusion is that the consumer does not have an asset that must be listed in the bankruptcy petition. Even if, for the sake of argument, the miles and points were considered “assets of the bankruptcy estate,” most debtors would be able to exempt them under a wildcard exemption. First, trustees recognize that it would be very difficult to administer miles and points as an asset considering they are very illiquid, and secondly, even if they did have value, most consumers who file for bankruptcy, and who have frequent flyer miles, would have miles worth so little in relative terms, that it would not be viable for the trustee to administer them as an asset. Can a Bankruptcy Trustee Compel a Consumer Debtor to Redeem Miles? Let’s suppose a creative and aggressive Chapter 7 trustee did learn that a debtor had a substantial cache of miles. Keep in mind that a trustee certainly could not sell an airline ticket – every program clearly prohibits that. Could the trustee compel the debtor to redeem those miles for gift certificates, which the trustee could then try to sell? I would argue that if the frequent flyer program stated that the miles were not the property of the debtor, then the miles never became an asset of the bankruptcy estate, and the trustee has no right to control that asset. A trustee would also have great difficulty pursuing them because of the standard provision in most frequent flyer programs, that the debtor’s membership in the program terminates upon the filing of bankruptcy. Technically, upon filing bankruptcy, all miles would then be lost. However, I believe the frequent flyer programs include this provision to protect the consumer from creditors, similar to a spendthrift provision, rather than punish a consumer for filing bankruptcy. Thus, it is unlikely that an airline’s frequent flyer program would terminate benefits to a consumer for filing bankruptcy, absent any meddling by a bankruptcy trustee. Frequent flyer programs have no incentive to become embroiled in a fight over miles. Nevertheless, consumers should not be parading the fact that they filed for bankruptcy to the frequent flyer or loyalty program, nor do they have any obligation to do so. Consumers should therefore be able to emerge from bankruptcy with their air miles in airline frequent flyer programs intact. 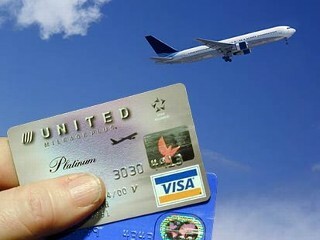 There is a major difference between airline or hotel loyalty programs and credit card rewards programs. With the credit card programs from banks such as American Express, Chase, Capital One and others, the likelihood is that the consumer owes the banks money. All such programs have provisions that freeze the points if the consumer falls behind with payments. Let’s take a typical scenario where the consumer has points in a credit card program such as American Express Membership Rewards. The consumer cannot use those points if the account is in default. That would certainly be the case once the bankruptcy petition is filed if there is any balance owed on the account. The issue in protecting the points is thus: If you think you need to file for bankruptcy, and you are current with your payments, should you quickly cash out the rewards points before you fall behind and the account goes into default? The short answer is YES. Here’s why it should be OK to do so. Let’s first address the potential argument the credit card company can conceivably make. They can argue that if the debtor cashes in the points just prior to filing bankruptcy then they engaged in some kind of bad faith conduct. However, the credit card company would have great difficulty proving this as the debtor should be able to argue successfully that the points were already earned, and that the debtor had the full right to use them regardless of any debt problems or future plans to file for bankruptcy. When it comes to bankruptcy cases involving credit card debt, the real issue is not whether the consumer redeemed points, but whether the consumer incurred the underlying credit card debt at a time when the debtor knew or should have known that they would not be able to pay their debts. Also, from a practical perspective, in my many thousands of consumer bankruptcy cases, I have never seen one instance of a credit card bank alleging an impropriety for redeeming rewards points. The value of points in relation to the amount of money that the consumer owes is so nominal, that banks will simply not go to any length at all to pursue a debtor who cashed them in. Accordingly, I would feel comfortable advising a consumer debtor client to immediately redeem the points or transfer them to an airline’s frequent flyer program, assuming there was no larger issue that the consumer incurred the debt to the credit card company under fraudulent pretenses. Another bit of advice: If you feel that you are about to fall behind with your minimum credit card payments, pull those rewards points out immediately. Otherwise, they will be frozen. You can transfer the points to airline or hotel loyalty programs, or redeem them for merchandise or gift certificates. Keep in mind that if you redeem them for goods or gift certificates, you would now have assets that should be listed in your bankruptcy petition. Let me leave you with an anecdote. Jim Kennedy, a 46-year-old California man, lost his six-figure corporate development job. At the time, he had about a million frequent flyer miles and rewards points in various loyalty programs including 125,000 American Express Membership Rewards points, 85,000 Starwood Preferred Guest points, 400,000 Hilton Honors points, 100,000 Delta Sky Miles, 120,000 American AAdvantage miles, and 200,000 United Mileage Plus miles. After running out of funds, losing his home to foreclosure, and having no luck finding a job, he filed for Chapter 7 bankruptcy. He emerged from bankruptcy with his miles intact. Thereafter, he lived for months in Holiday Inns and Motel 6’s by converting his frequent flyer miles into hotel points. This also helped his food budget because the motel provided free breakfast to its guests. He regularly reported his plight on his blog and on Twitter. His story was publicized by a number of newspapers and TV stations on the West Coast. Last year, when he was down to just a month’s worth of free hotel nights, he found a job. The lesson is that frequent flyer miles can sometimes really help, even after bankruptcy. About the Author. Long Island Bankruptcy Attorney Craig D. Robins, Esq., is a regular columnist for the Suffolk Lawyer, the official publication of the Suffolk County Bar Association in New York. A version of this article appeared in the February 2012 issue of the Suffolk Lawyer. Mr. Robins is a bankruptcy lawyer who has represented thousands of consumer and business clients during the past twenty years. He has offices in Mastic, Patchogue, Commack, West Babylon, Coram, Woodbury and Valley Stream. (516) 496-0800. For information about filing bankruptcy on Long Island, please visit his Bankruptcy web site: http://www.BankruptcyCanHelp.com.